multi­line speaker telephone with data port in each guest room. Luxury permeates everything at Green Valley Ranch Resort and Spa. A Las Vegas destination unlike any other, the property places as much emphasis on personalized service as it does on opulence and entertainment, making it an especially attractive choice for functions that combine business and leisure. The breathtaking, Mediterranean-style resort houses 495 guest rooms and suites and welcomes gatherings of all sizes, including groups of up to 1,600. The numerous meeting venues range from the stunning Estancia Ballroom to the stately Conference Center to 8 lavish acres of gardens and terraces perfectly suited for outdoor affairs. Equally appealing is the resort’s experienced and ever-cordial catering and sales staff, who remain on hand to manage all details throughout the planning process and the event itself. After a busy day of meetings, guests can try their luck at the world-class casino; venture to The District, an open-air shopping promenade next to the resort; or catch a concert at 2,000-seat Grand Events Center. For guests who prefer relaxation over revelry, options include soaking up the sun poolside, indulging in a hot stone massage at the tranquil spa, sitting back for a movie at the onsite theater, or retreating to their serene and spacious guest rooms, where they can order room service and enjoy views of the glittering Las Vegas Strip. On every level, from the moment of arrival, to the closing session and everything in between, Green Valley Ranch and its staff exceeded all expectations. The only downfall is the internet capabilities and cost in the Meeting and Function facilities. I have hosted several meetings/events at GVR and they continue to exceed my expectations. In my new venture I plan to put them at the top of my list of properties for my clients. I would like to take this opportunity to acknowledge the quality experience that is a consistent trademark of the Green Valley Ranch Resort. I have had the benefit of enjoying/utilizing the property for my groups ranging in size from 50 room nights to over 1700, and regardless of the size or stature, the professionalism and efficiency, from the start of the sales process through the final billing has ALWAYS been of the highest standard. Moreover, the property complemented this performance with an easy "homey" feeling (a rare combination of traits). Even clients that I have placed there as individual transient stays commented on the value of all the "Vegas trappings" without the eclectic nature that typically accompanies a Vegas stay. It is without hesitation that I would place groups at your property, as you can always count on a value added stay. I decided to do my part for the Las Vegas economy and hold two public seminars there in November of 2009. We selected the Green Valley Ranch in Henderson, off the strip, and I could not have been more pleased. EVERYTHING at the resort was first class. The people, the service, the meeting rooms, the hotel rooms, and especially the food. Before we left the property, we booked it again for this year. Had to. Too nice of a place, and too good of a deal. As we approach our return to Green Valley for another P+W Software Annual Client Conference, I wanted to take this opportunity to extend my thanks to you and all of the GVR staff for the outstanding efforts put forth to once again assure a smooth and successful event. Throughout every stage of event planning, from the initial contract negotiations, through the convenient and easy room reservations process, to the front end check in and beyond, your staff has been consistently respectful of the meeting planners and all of our client guests. I would be remiss if I didn't single out the pre-conference attention to detail in preparation of conference BEOs. Other properties struggle with the difficulty of transferring client requests to paper, but as we all know, advance preparation and creation of the BEOs are the heart of the program. In our 22 years of hosting this event, never has the attention to detail been better. The final product is indicative of this attention to detail...with Kara Ledbetter's guidance, the final product to hit the banquet tables exceeded our expectations every time. Isn't that reason enough to come back year after year? It is for us! In closing, we were pleased, no delightfully impressed with every member of the GVR team, from the doorman up to the General Manager. We look forward to our return next month, and for at least the next two years hence! My sincere thanks for a job well done. 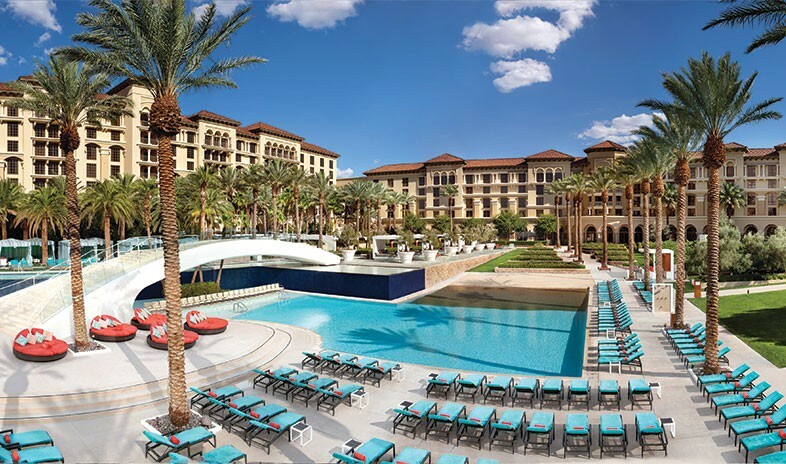 Our company has hosted two major technology industry events at the Green Valley Ranch and one at the Red Rock – and each one has been more spectacular than the last. The food is consistently rated top notch by our delegates and the accommodations and meeting space are beautifully appointed and designed as ideal settings for high-end meetings. Further, the staff is not only professional, but always attentive and committed to going above and beyond. From the sales leadership to the banquet management and servers, the Green Valley and Red Rock teams truly stand out among the many hotel teams that have served as our event hosts over the course of a decade. Finally, the off-strip location of both properties is a tremendous benefit. Delegates can gamble to their hearts' content during the program's off hours, but they are never distracted by the crowds, and bells and whistles during the business component. These properties are truly among the best kept secrets of the meetings business. Beautiful bohemian-jeweled decor & quality destination hotel. Hip Euro style co-ed, underground spa; huge pool area; & fun evening activities. Great property off the strip in Henderson, very comfortable accommodations. Did a site visit in 2007. Beautiful property about 15 miiles off the strip - loved the location - you don't get the distraction of being downtown Las Vegas. They have the most beautiful backyard I have seen in a long time and it would be perfect for receptions. The Spa is beautiful and you truly feel that you have stepped into a world of tranquility. The meeting space is well laid out with nicely sized meeting rooms. The food is superb - and they have some of the most creative F&B options I have experienced in awhile. Everthing at this property was very nice. There were a few minor hiccups with the staff, nothing too major, but overall, over group was happy. Great location if you wouldn't mind being off the strip. Beautiful rooms, fairly traditional decor. Excellent front-desk service. Restaurants were excellent, with fair pricing. I personally liked the location very much, but some attendees might wonder why go to Vegas if you're not in Vegas? (It's about 30 minutes outside the city.) Gambling on-site for bettors, but also adjacent to appealing outdoor activities (hiking, mountain biking). Beautiful property a few miles from the strip. Same hotel that was in American Casino reality series. Exceptional in every way!! LAS VEGAS, NV...Station Casinos LLC will invest $20 million over the next year in Green Valley Ranch Resort by introducing a new lineup of four acclaimed restaurant and bar concepts, as well as enhancing other venues and amenities within the AAA Four Diamond award-winning property in Henderson. New concepts include Mercadito, Tippling Hall, Pizza Rock and Tony’s Slice House.